If you have limited time and need a feeling of an adrenaline rush, whitewater rafting on the Bhote Koshi River (also translated as the river from Tibet) is the perfect one for you. The Araniko Highway resides along this river making an easy transport way to Lhasa from Kathmandu. Even looking at the river with rapids of class 3, 4 and 4+ you will be excited and feel an adrenaline rush. 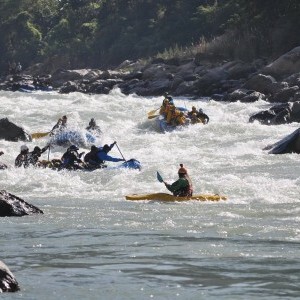 The put in point of this rafting trip is the lower part of Khadichour, which is a 3-hour drive from Kathmandu, and the take-out point is the Sukute Beach, but the put in point changes during the monsoon season. 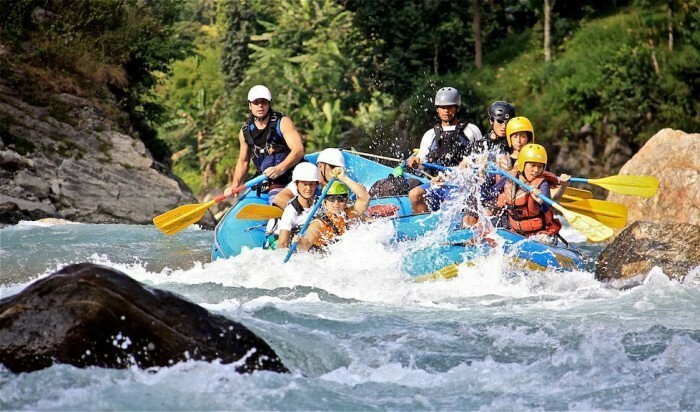 The rafting journey is suitable throughout the year and the difficulty of the rapids depends on water level. If you are looking for a thrilling white water experience with limited time, this rafting expedition is just the right one for you and we can do it in one or two days it all depends on your time frame. 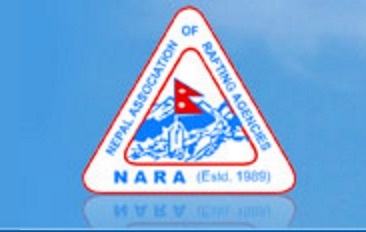 From Adventure Hub Nepal Thamel Kathmandu office we will drive to Khadichour which will take around 3 hours. After the professional guides brief you about safety and paddling instructions, we will get ready to start our river journey. We will hit continuous rapids of class 3. After rafting for around 16 kilometers, we will reach the take out point and set up our camp there or drive back to Kathmandu as per your interest. We will start the final day of our rafting trip driving up to Jambu, which is our second put in point. It’s going to be challenging day as we will hit a lot of rapids of class 3 and class 4+ standard. Tackle rapids such as ‘Barking Dog’, ‘Midnight Special’ ‘Dazed and Confused’ and look at the ‘Great Wall’ which isn’t run able. After an hours rafting, we will again hit many major rapids like ‘Liquid Bliss’, ‘Fake Right’ ‘Go Left’ and ‘Golden Gate’ and then we reach our take out point, Sukute beach. We will have a nice warm lunch at the beach and head back to Kathmandu which will take around 3.5 hours drive in private bus. We can run this trip from September to December lower Bhote Kosi and the Upper Bhote Kosi mid October to December and from March to May. We can run whitewater rafting/kayaking here every day for the lower Bhote Kosi trip on your request.